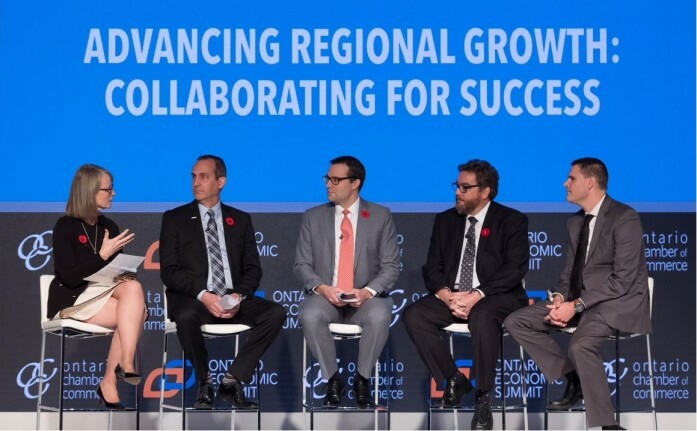 Resolute added its voice to a distinguished group of municipal and business leaders who recently attended the 2017 Ontario Economic Summit to discuss new opportunities to grow the province’s bottom line.Rémi Lalonde, general manager of Resolute’s Thunder Bay pulp and paper complex, and other panelists shared their insights on the need for inclusive regional economic growth across Ontario. Rémi highlighted Resolute’s partnerships with regional communities, academic institutions and First Nations to develop mutually beneficial business opportunities and to help address recruiting challenges in Northwestern Ontario. The 2017 Ontario Economic Summit, hosted by the Ontario Chamber of Commerce in Niagara-on-the-Lake on November 8-9, featured thought-provoking debates and strategic sessions with 200 economic leaders from a diverse range of sectors.